I seem to have been going through a spate of retiming on my Box Saloon recently. In part due to taking the dynamo off a few times and getting grease onto the commutator, new brushes and a running problem that is still not resolved but must be somewhere between the carburettor (new jets, even swapping over to another carburettor, but the problems are still there) and the ignition system. The box saloon (high frame) has a Ruby engine (low frame) fitted and the top of the flywheel cover is very close to the bottom of the bulkhead and throttle cross shaft, which means it's a pig to get it off when trying to set the timing to 'Max Advance' at 1 ¾" B.T.D.C. That's the way I do it anyway, and if it's good enough for 'Bill Williams' specials, that's good enough for me. Others seem to be able to adjust the timing listening to the sound - it's all Schoenberg to me especially as I'm partially deaf and cannot distinguish any sound above 10 Khz (I can't hear mobile phones ringing or wrist watch alarms etc.). So, as with the screw driver slots on top of the dynamo bolts, some clever person in the club said why haven't I got a marker fixed to a dynamo bolt pointing to a mark on the cam shaft/fan belt pulley. Probably because Herbert Austin hadn't anticipated my frustrations some 70 years later! 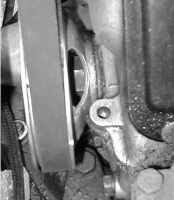 Photo 1 shows the situation of the pulley before fitting the marker (the bolt is out and the white mark's there because this is a retrospective report). Photo 2 (right) I made a marker as shown. The longer edge is to fit along the side of the dynamo body, so that each time I have to 'undo' / 'do up' the bolt, the marker will not easily twist. Photo 3 shows the project complete. I set the flywheel to 1 ¾" B.T.D.C. (Maximum Advance) on piston 1 and made a nick in the pulley opposite the marker. I then filled the nick with a bit of white paint. Now maximum advance can be checked. If I require T.D.C then I can rotate the camshaft pulley to a point before the marker. I use a strobe ignition lamp to check the timing (powered from a separate 12 volt supply). The only real problem is the accuracy of the mark, the flywheel at 10" diameter goes round twice to one revolution of the camshaft's 4¼" pulley. So 1¾" on the flywheel is only 1/4" approx on the pulley. But I can now check that I've got everything more or less right. Another advantage of the pointer and mark is to ensure that the ignition is firing at the end of the compression stoke of the engine rather than the exhaust stroke. Every time the dynamo is removed, or the distributor is removed the timing positions can be so easily lost. If you use the flywheel marks alone you can set up the engine 180 degrees out. With the marker you can always check that it is firing on the correct stroke, final timing can be done by ear (for those with good ears!) or by engine performance. The Box Saloon is still having problems, but I don't trap my hand now removing the flywheel cover. This article, written by Sandy Croall, originally appeared in CA7C Seven Focus in Oct 2004 pp24-25.